Campsite 1 on the New River is around 1 mile from the put-in at FR 22 and several miles through winding sandy forestry roads by car. Normally the water is up to the banks. Here are some other photos from that site. Campsite 17, the next campsite on the river, around 8 miles down has exposed logs around a bend to the north of the campsite. At Gully Branch Road a young kayaker from Wacissa was docking his Bass Pro fishing kayak, his day an absolute bust, but he was grateful that he caught the inflowing tide on the upriver paddle back to where his van was parked. He’s camping at Pidcock Road campground on Cash Creek and yesterday caught 16 fish. We’ve always seen fish jumping on Cash creek, rarely on the New, but he was hoping to get a few catfish. Tomorrow his friends are joining him; hopefully they’ll be successful. Lots of hunters on the roads. 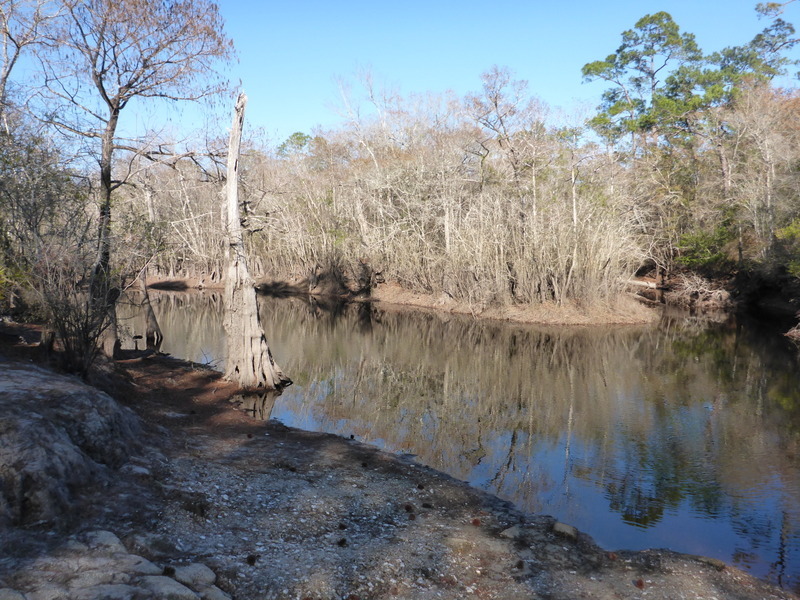 This entry was posted in New River, Tate's Hell State Forest and tagged New River, Tate's Hell State Forest on January 19, 2018 by marylynanded. Below freezing week before — green fly orchids still blooming! 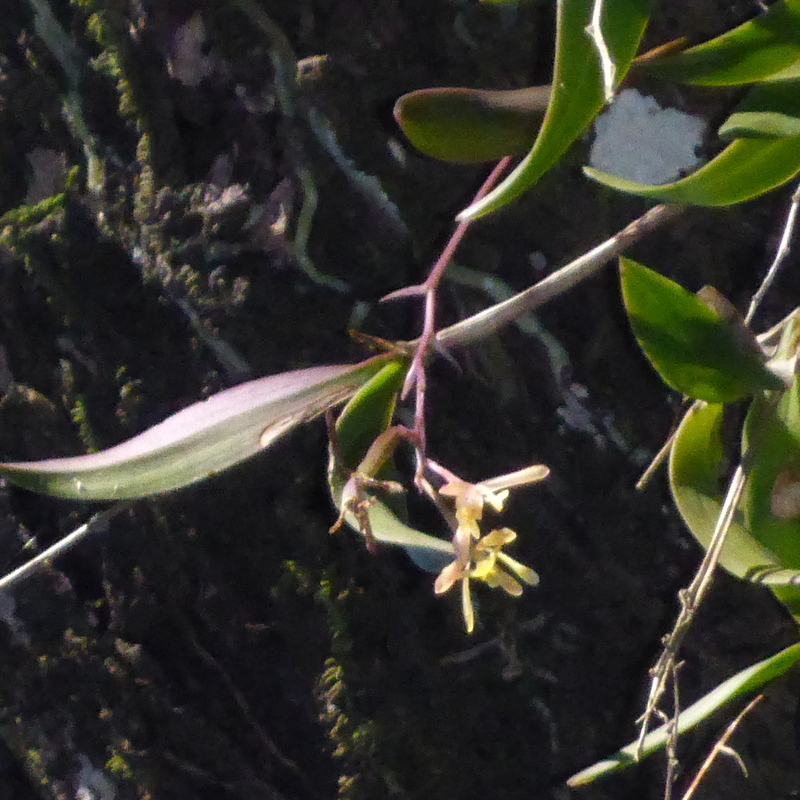 The only tree orchid in north Florida, the green fly orchid, supposedly blooms in the spring and summer. Not so on Womack Creek. We’ve seen it blooming all year round. This one survived the one week of freezing temperatures. January 13, 2018. 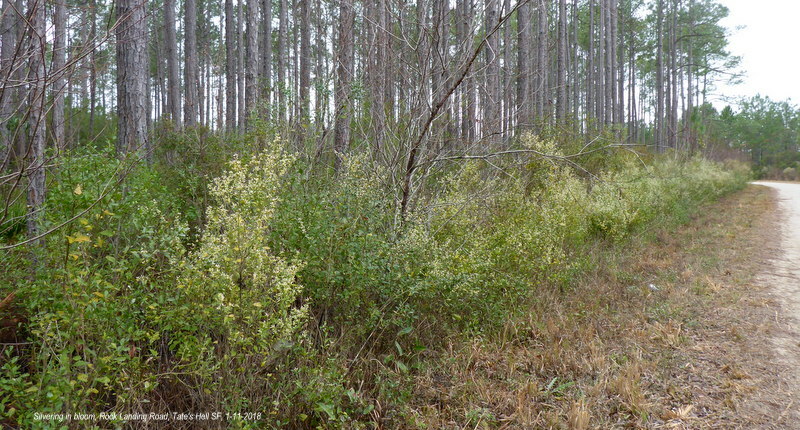 This entry was posted in Native Wildflowers, Tate's Hell State Forest, Womack Creek and tagged Florida native wildflowers, Tate's Hell State Forest, Womack Creek on January 13, 2018 by marylynanded. 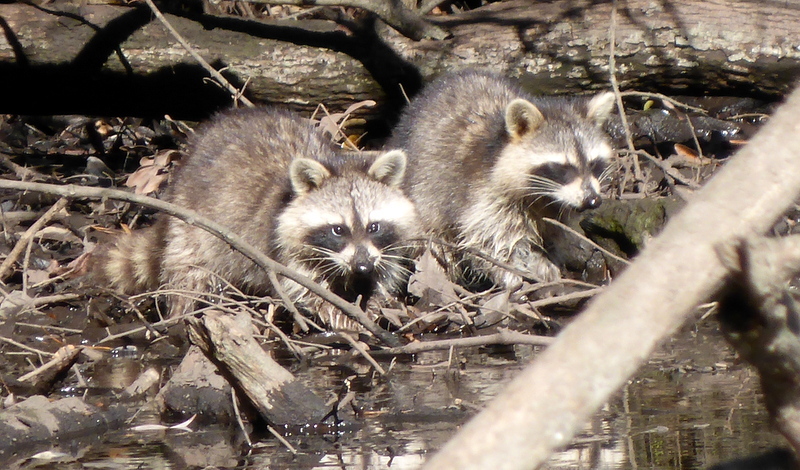 How about them li’l raccoons? 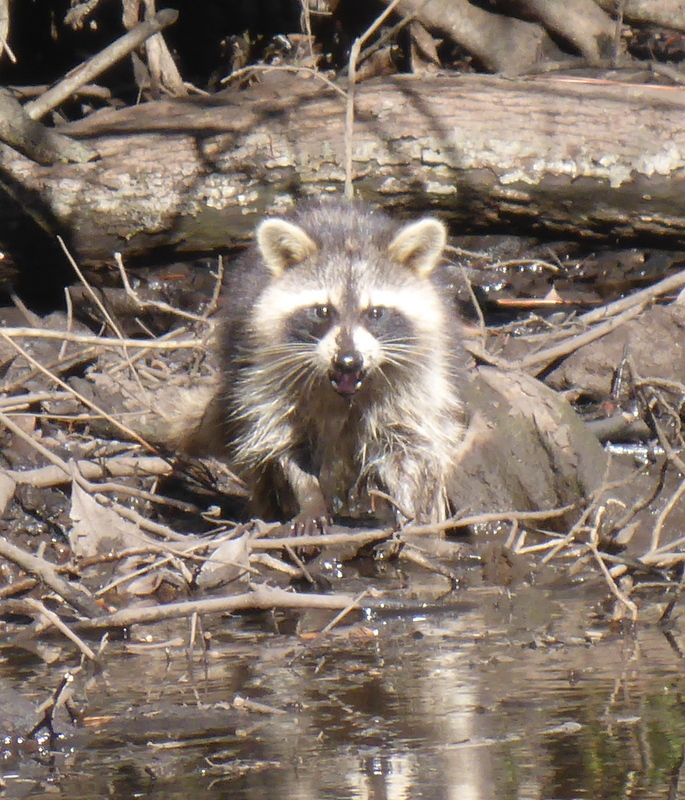 Mother raccoon and her two kits were foraging in the mud, probably for crayfish or other small creatures. Normally nocturnal feeders, they took advantage of unusually low water levels to feast on what lay below the mud. 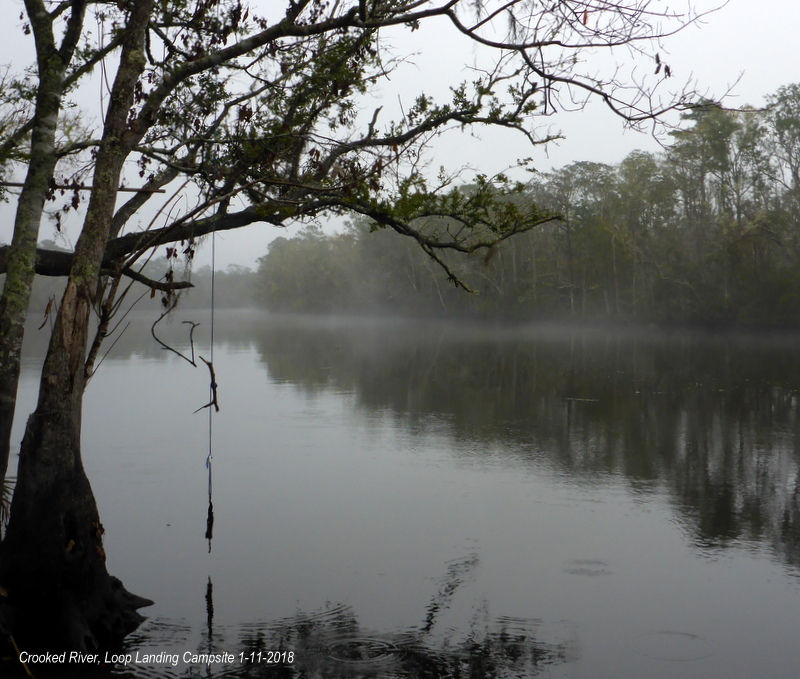 Paddling upstream on January 13, Saturday, 2018 with temperatures at 37F and winds measured on our portable aeronometer at 10mph (windchill of 27), we saw little stirring except the birds in the bush and overhead. One large alligator took advantage of the sunny day to get a few hours of warmth. 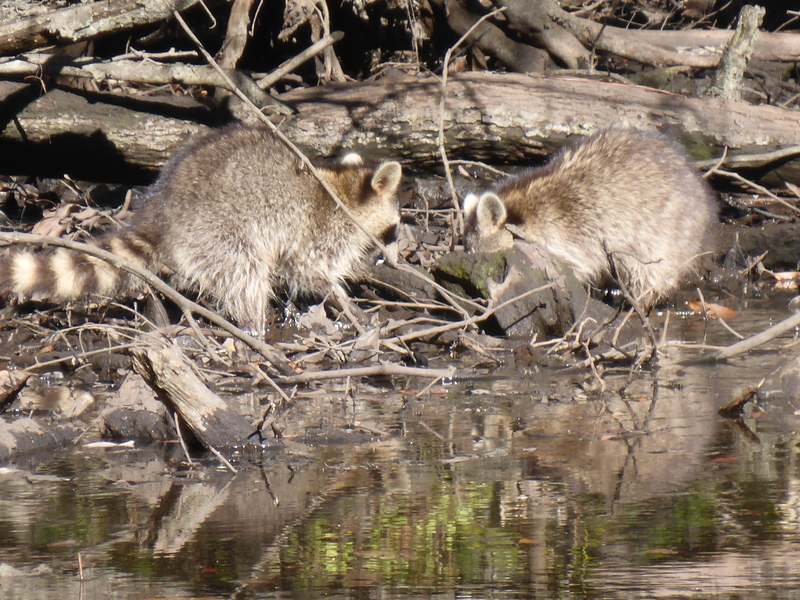 These raccoons had the river bank to themselves. 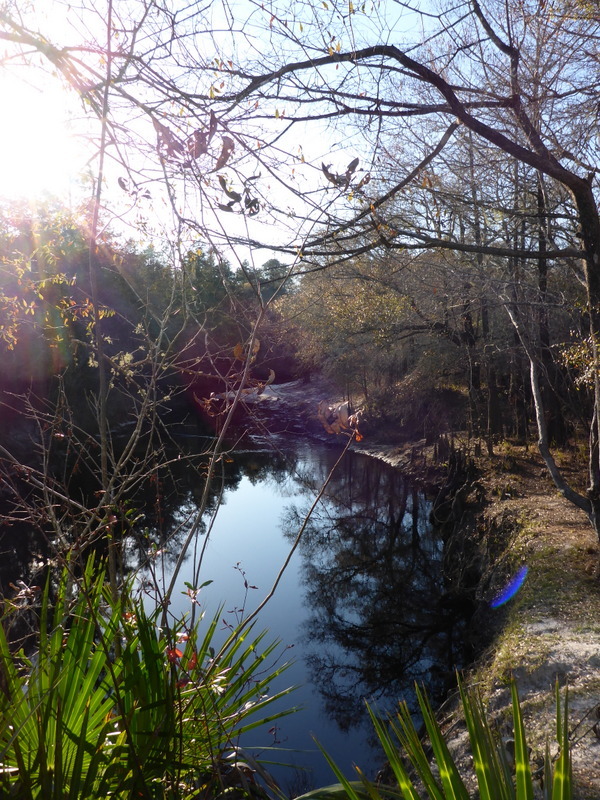 This entry was posted in Tate's Hell State Forest, Womack Creek and tagged Florida mammals, Womack Creek on January 13, 2018 by marylynanded. Rocking Landing on the Crooked River has 3 campsites, a nice day use area with covered pavilion, and vault toilets. The concrete landing is a favorite landing for boats. 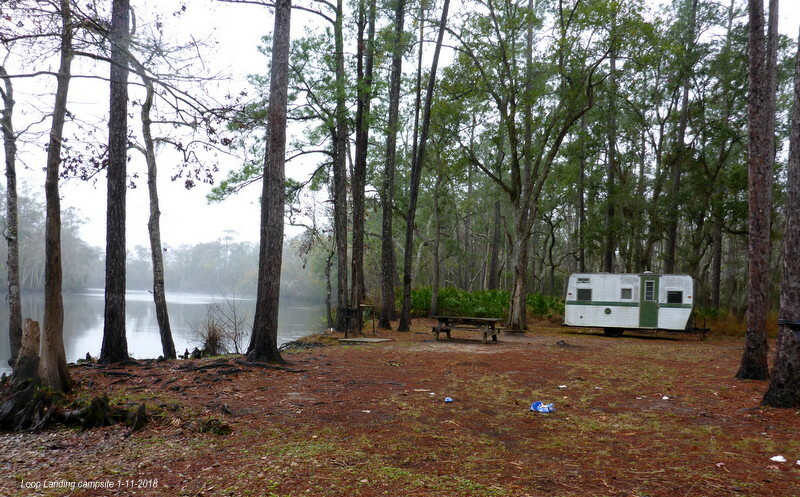 This campground is a 2.5 miles walk to the Womack Creek Campground with its showers and flush toilets. There is no potable water source here. The covered pavilion and a concrete picnic table/bench near the water provide good places to stop for a picnic. There are three camp sites, out of the way of the Day use area, but near the vault toilets which can be seen on the right side of the road. 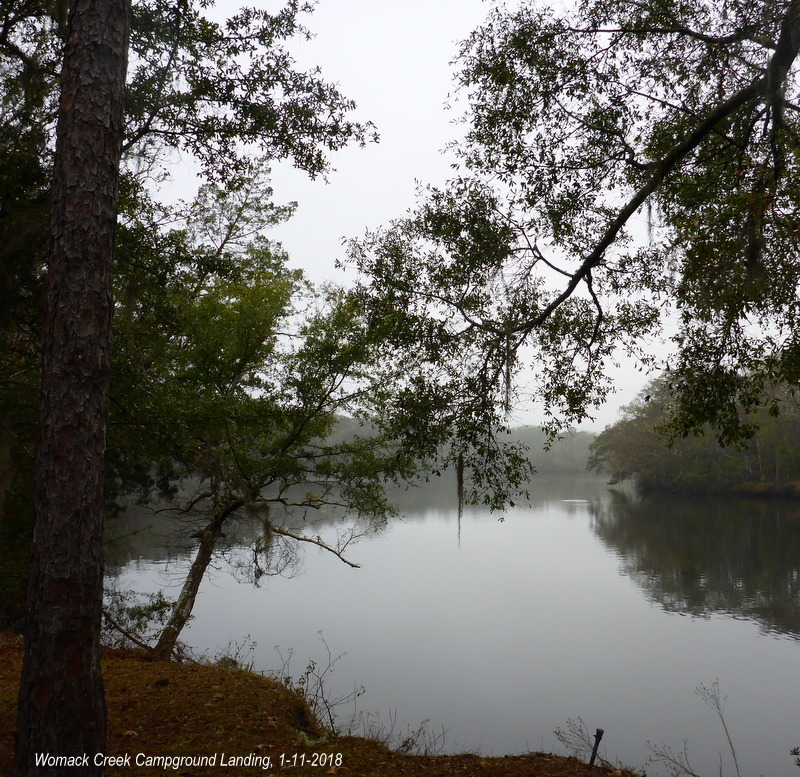 This entry was posted in Crooked River, Crooked River, Tate's Hell State Forest, Tate's Hell State Forest camping and tagged Crooked River, Tate's Hell State Forest on January 11, 2018 by marylynanded. It was drizzly, but the fog had lifted. 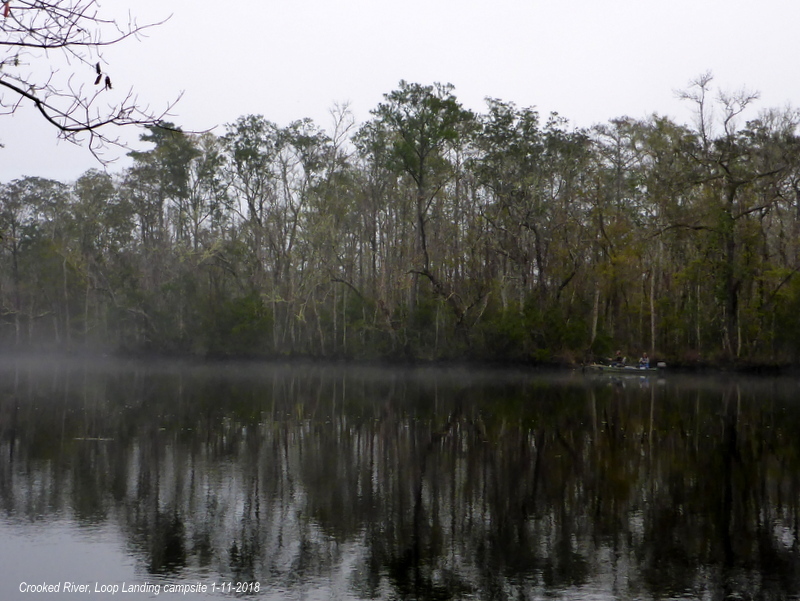 It did not deter the two fishermen who had launched from Rock Landing, east on Crooked River. 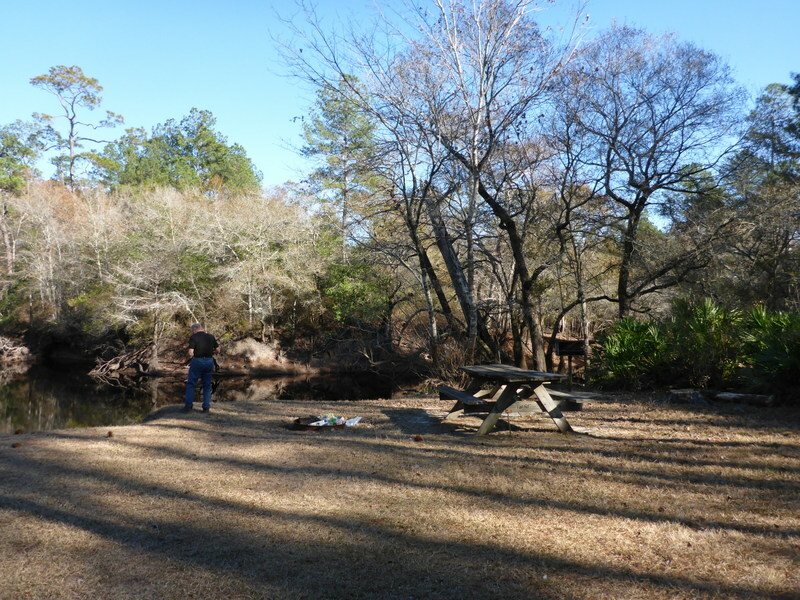 This is one of the nicest primitive camping sites in Tate’s Hell, very private and secluded and on the Crooked River. Today, a camper was parked there and there was trash all around which we picked up and deposited at the trash bins at Rock Landing Day Use area. 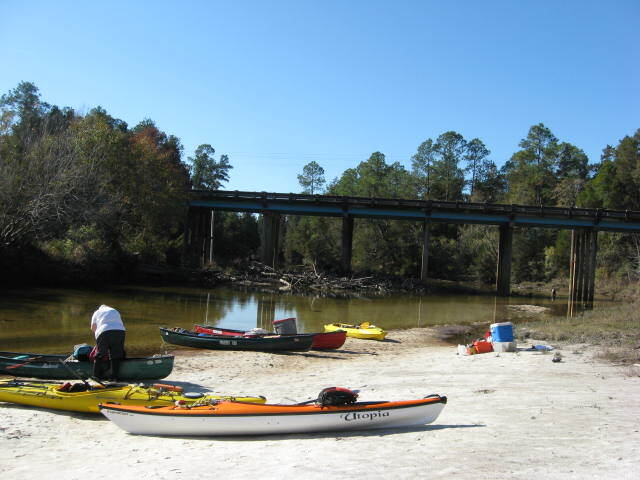 There’s a landing perfect for canoes and kayaks. And a long private driveway, although only a 1 mile walk to the Womack Creek Campground with its flush toilets and hot showers. Lovely place to camp and to paddle. 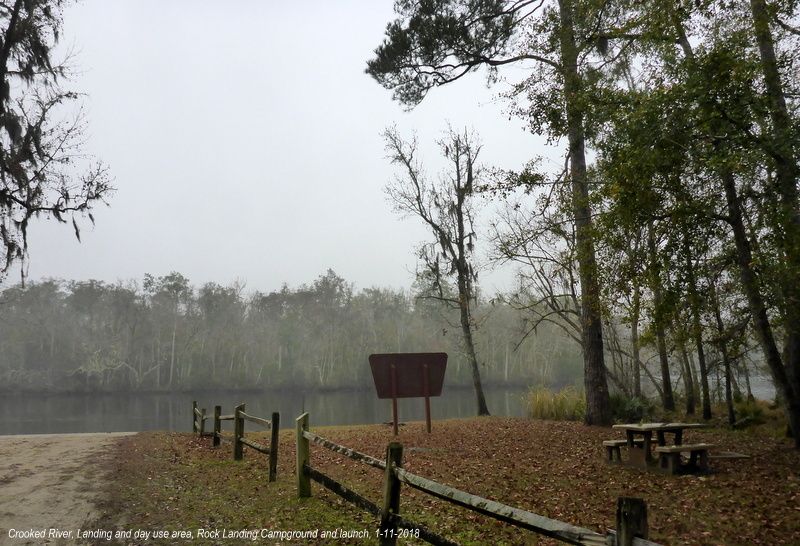 This entry was posted in Crooked River, Tate's Hell State Forest camping and tagged Camping Tate's Hell State Forest, Crooked River, Tate's Hell State Forest on January 11, 2018 by marylynanded. 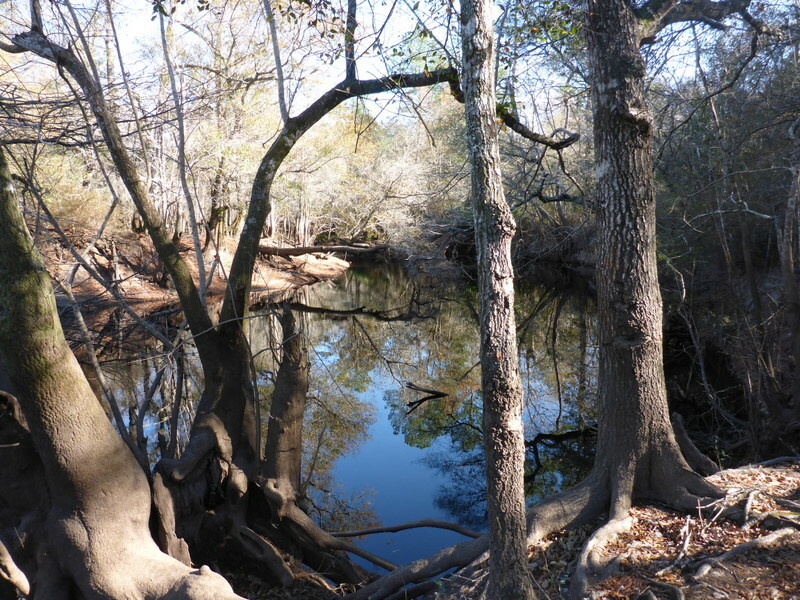 Yesterday, after a week of sub-freezing lows and cold days, we ventured out to a monitoring paddle on Womack Creek, Tate’s Hell. Kayaks unloaded at the landing, we discovered we left our camera at home — 63 miles away. 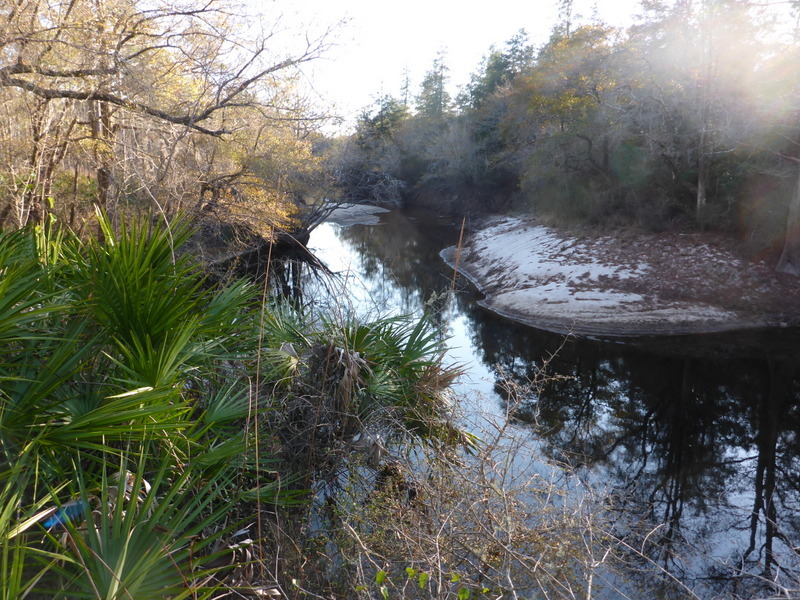 Our reports are mainly photographs of changes on the creek — no camera, no report. We chose to return home to try again today. The weather report predicted a slight chance of rain, but overcast skies. This was OK.
Today, we left home one hour later. Had we left at the same time as yesterday, we would have been driving in thick fog. The fog lifted, we had sufficiently visibility, but, approaching the Franklin county line, the windshield showed droplets of light mist, which increased to minor drizzle. 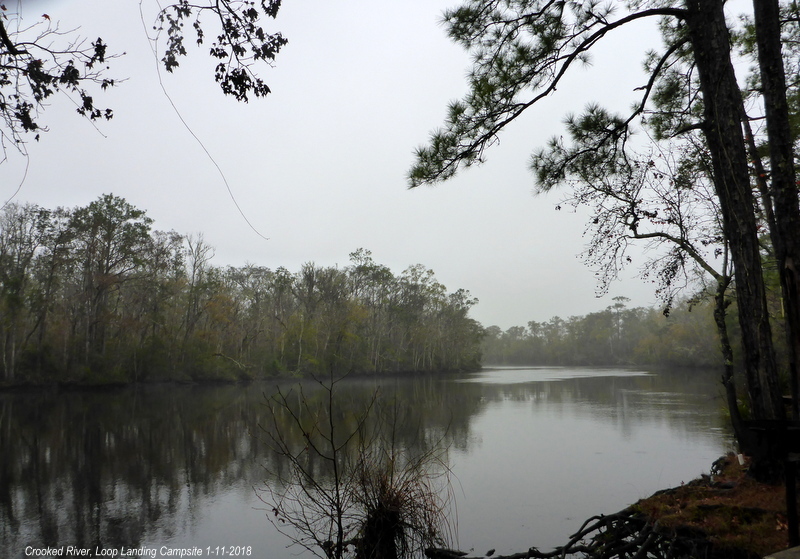 The temperature was in the 60’s, not enough to cause hypothermia, but these drizzly rains can really soak into you on the creek, so we decided to check out two nearby campgrounds which we hadn’t seen for over a year instead of waiting out the rain. Both are nice camping spots on the Crooked River. 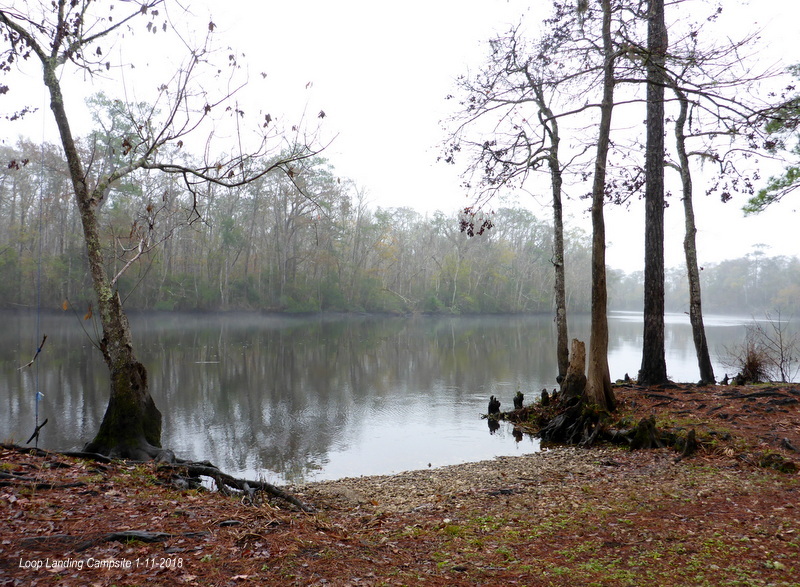 When we returned to Womack Creek landing, this is what we saw. It was still raining; we chose not to spend the next 3-4 hours up the creek and drove home again. 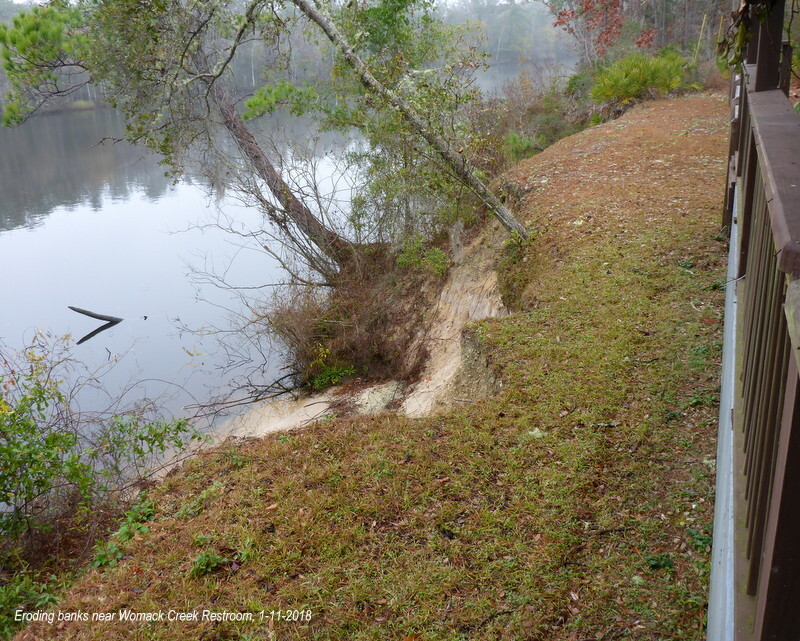 Potential campers and paddlers, however, may want to see what Womack Creek Campground looks like. This is the day use area with a covered picnic area and 2 grills and full service restrooms. Water is not potable — bring your own. 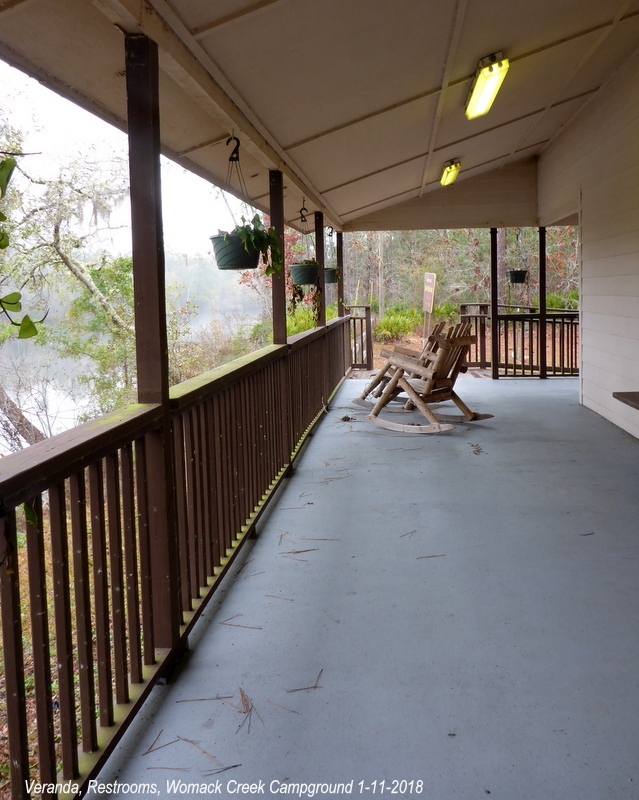 When camping, this very wide veranda in the restroom building is a great place to rock and enjoy the Ochlockonee River. It’ll be a matter of time before the whole restroom building is going into the river. Camp hosts have mentioned this situation to management, but little seems to have been done to correct the erosion. It is now closing in up to the dripline of the roof. Mark, the host, keeps the restrooms very fresh & clean and uses his own money to pay for soap, hanging plants and homey touches to the restroom. 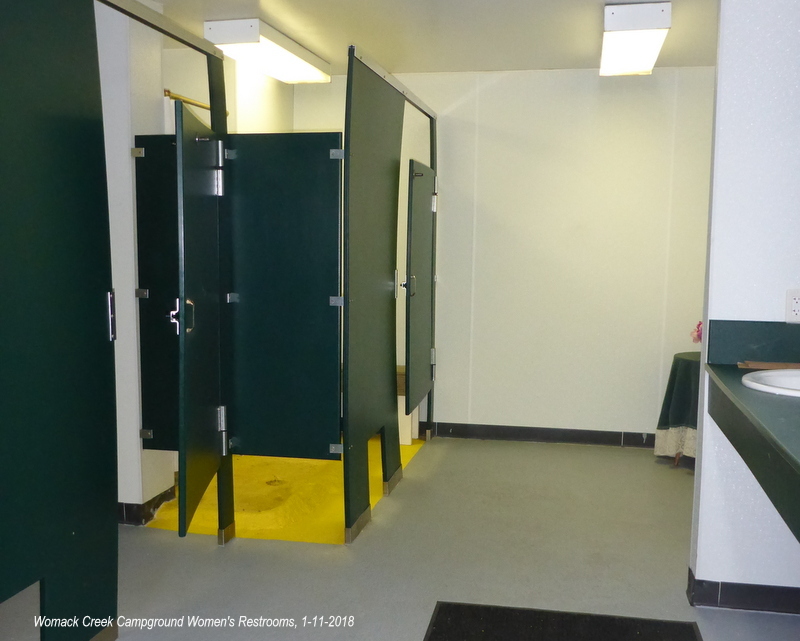 This is the women’s restroom with 2 toilet stalls and one shower stall. 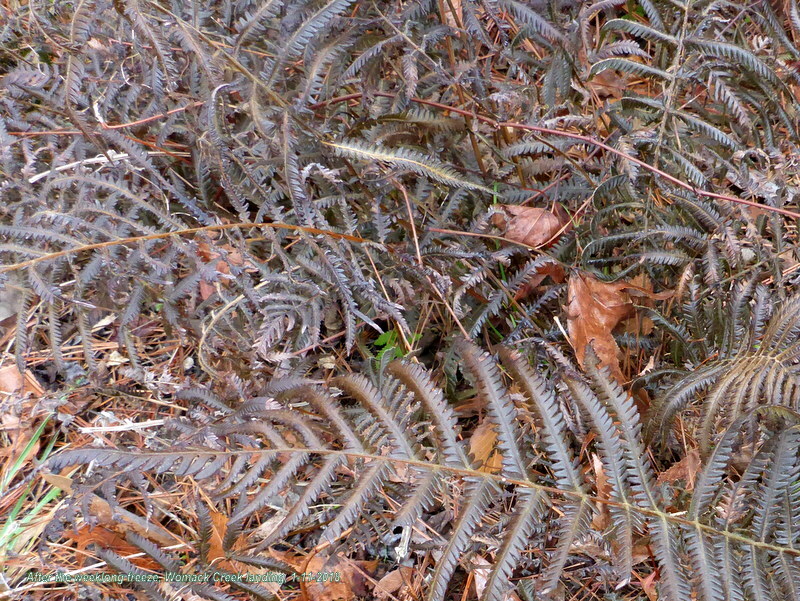 The freeze the week before left bronzed fern plants at the landing. 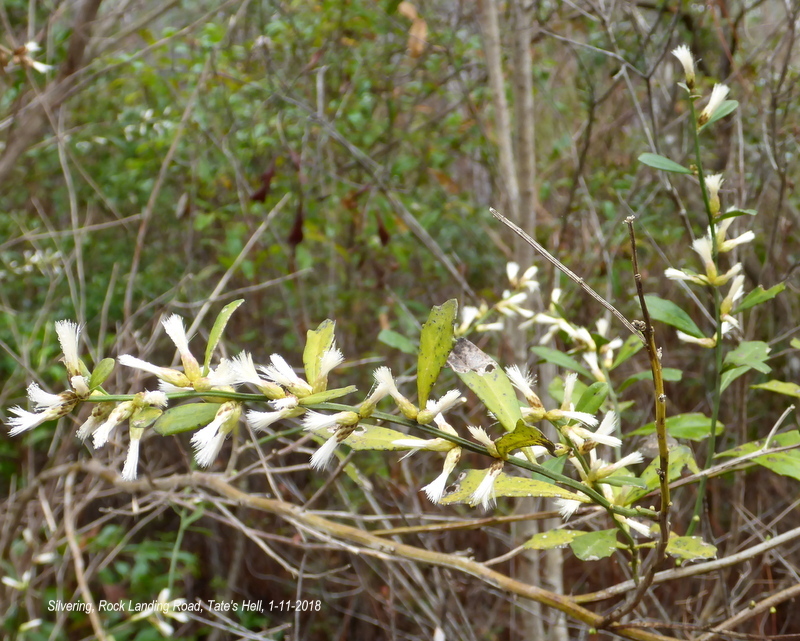 Silvering, a common shrub along the creek which blooms after the vining aster and at the same time as Simmon’s aster was very late in blooming this year. 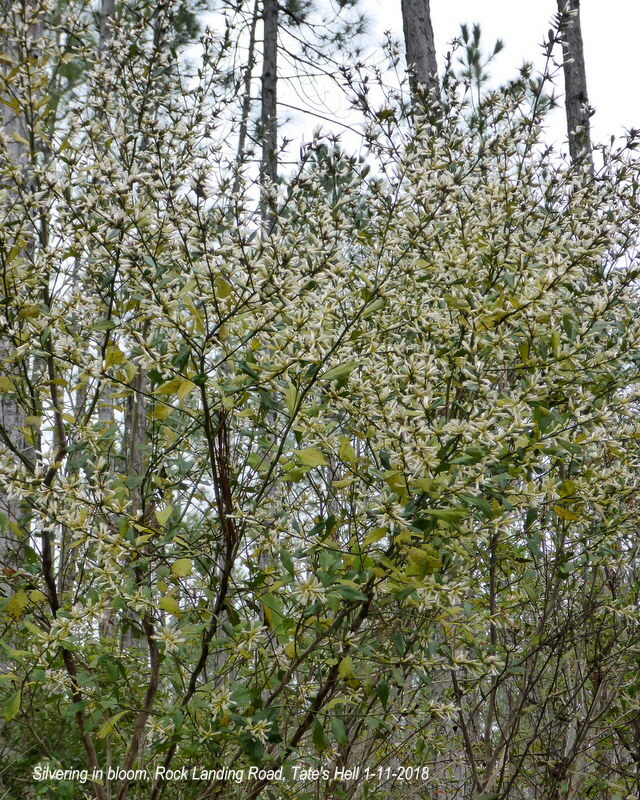 Along Rock Landing Road in Tate’s Hell, they were not deterred by the freeze and were blooming — hedgelike rows of them. 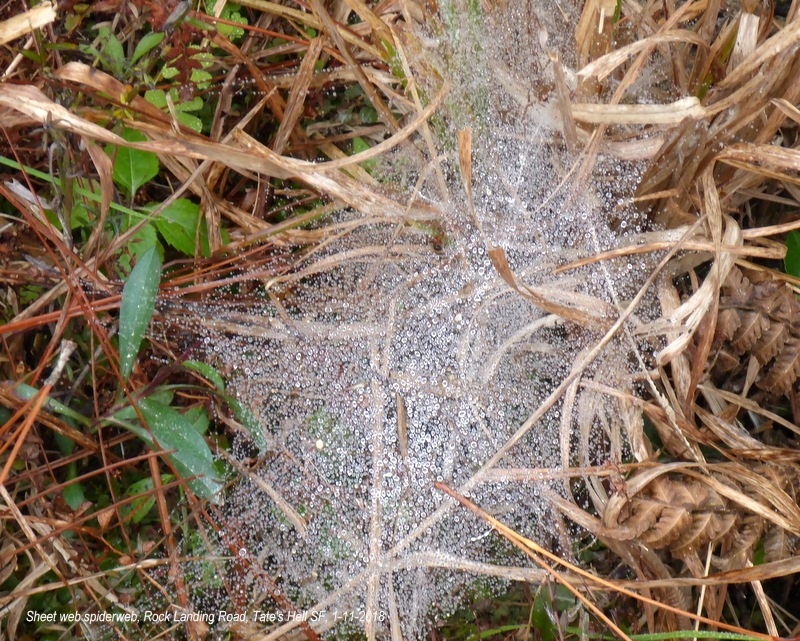 No bees on them, which one would normally see, but in the grasses below — sheet spider webs. Spider webs were everywhere: the customary orb shaped, the balled up confusion-shaped on branches of trees and these every-which-away sheet nests on the ground catch dew which, even in the light of a cloudy sky, calls attention to them. 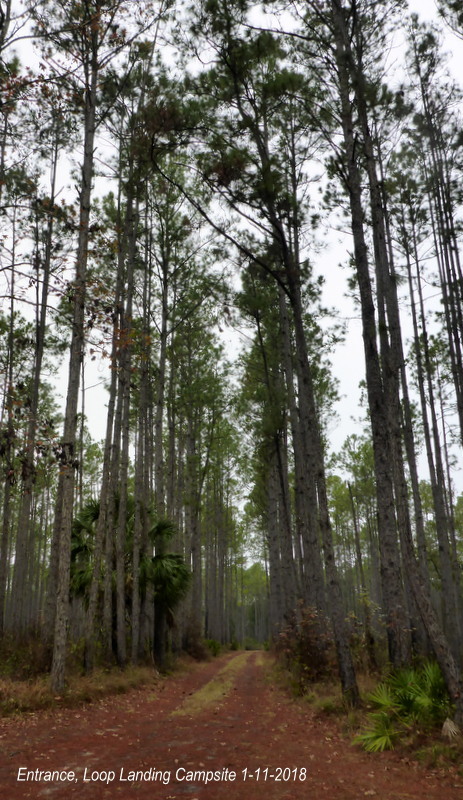 Even on a overcast, drizzly day, the forest gives back visually. 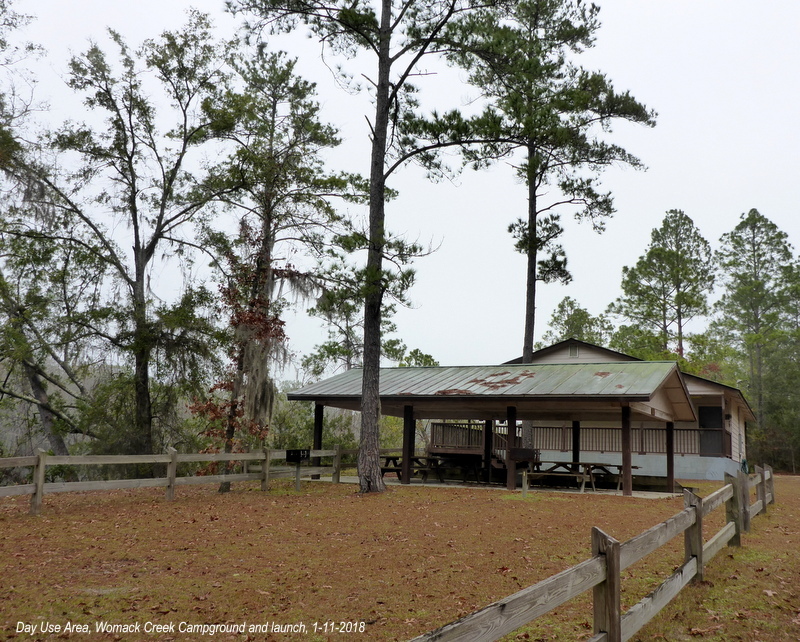 This entry was posted in Tate's Hell State Forest, Tate's Hell State Forest camping and tagged Tate's Hell State Forest, Womack Creek on January 11, 2018 by marylynanded.